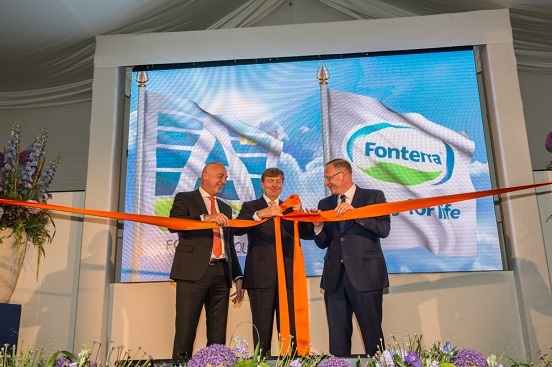 Multinational dairy co-operative Fonterra has extended its global reach with the opening of a new state-of-the art factory in Heerenveen, Netherlands. The new site is adjacent to Netherlands’ A-ware Food Group’s cheese plant and processes whey and lactose – by-products of the A-ware plant’s cheese making process. Speaking at the site opening last week – which was attended by His Majesty King Willem-Alexander of the Netherlands, as well as representatives of both companies – Fonterra CEO Theo Spierings said the site was chosen due to its proximity to the milk source and the A7 motorway, which made it accessible for tankers and logistics transport. “Our strategy is a good fit with A-ware’s long-term vision, so it’s a win-win for both companies and it’s great to see the partnership come to fruition,” Mr Spierings said. He said the new factory is Fonterra’s first wholly owned and operated ingredient plant in Europe, capable of processing one billion litres of milk annually. “We have substantial intellectual property in manufacturing functional whey protein ingredients, and having a high-quality, high-volume source based in Europe will allow us to commercialise these innovations for our customers all over the world,” he added. The Heerenveen site has a peak whey processing capacity up to 2.7 million litres per day, with annual production capacity of 25,000 tonnes lactose and 5,000 tonnes protein products. It produces three variants of lactose powder and a range of protein products including whey protein concentrate, whey protein isolate and a high fat whey protein concentrate, as well as several specialty functional whey protein concentrate powders. According to Fonterra’s press release, the new plant in Heerenveen employs 50 staff and operates to international sustainability standards while also meeting the requirements of global Standard for Food Safety.